Sen. Kirsten Gillibrand's (D., N.Y.) campaign is blaming its low fundraising haul—$3 million in the first quarter of her 2020 run—on comments last year which helped lead to former Sen. Al Franken's (D., Minn.) resignation. Gillibrand displayed outrage over accusations and photographic evidence of Franken mistreating women throughout his public and political career. Her comments prompted his resignation, which some critics argued was risky for Democrats desperate to regain a Senate majority. In a document obtained by the New York Times Gillibrand's campaign claims that "many" donors still hold Gillibrand's comments against her. "There's no question that the first quarter was adversely impacted by certain establishment donors—and many online—who continue to punish Kirsten for standing up for her values and for women," the document says. Gillibrand has also faced criticism for stating that former President Bill Clinton should have resigned over his affair with Monica Lewinsky. In a CNN town hall, Gillibrand told host Erin Burnett that she doesn't believe her criticism of Bill Clinton has cost her the support of Hillary Clinton. "Secretary Clinton is still a role model for all of us. 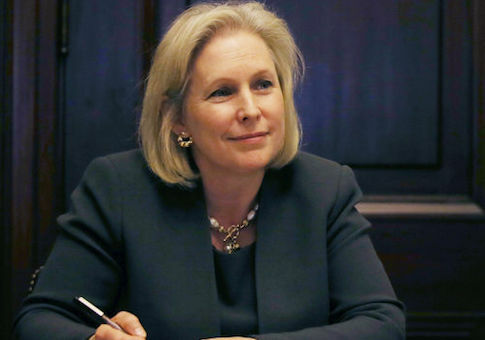 My views on her husband are very different, and I've said all I'm going to say about that," Gillibrand said. Gillibrand's fundraising numbers rank eighth among all the Democratic candidates in 2020 and last among the six senators running for president. Sen. Bernie Sanders (I., Vt.) leads with $18.2 million. Following him are Sen. Kamala Harris (D., Calif.) with $12 million and former representative Robert O'Rourke with $9.4 million. South Bend Mayor Pete Buttigieg also ranks high, having raised more than $7 million since announcing his candidacy on Sunday. Gillibrand’s total haul, which she has collected over the past two and a half months, is about half of what Sanders and O'Rourke collected within the first day of their campaigns, the Times reports. President Donald Trump's fundraising numbers beat all of the declared Democratic candidates, with over $30 million raised in the first quarter of 2020. This entry was posted in Politics and tagged 2020 Election, Al Franken, Kirsten Gillibrand. Bookmark the permalink.